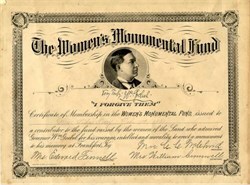 Beautiful certificate from the Women's Monumental Fund issued in 1901. This historic document was printed by Courier-Journal Litho and has an ornate border around it with a vignette of Kentucky Governor Wm. 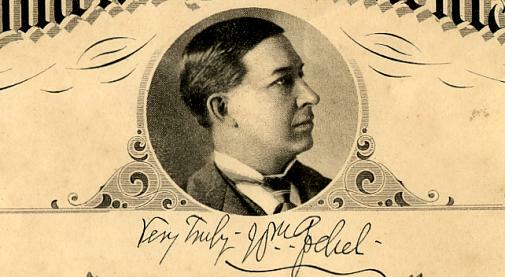 Goebel with the printed signature of Wm. Goebel. Certificate Reads " The Women's Monumental Fund " I Forgive Then" Certificate of membership in the women's monumental fund issued to ( handwritten Mrs. Lida Terry Feb. 11 1901) a contributor to the fund raised by the women of the land who admired Governor Wm. Goebel for his courage , intellect and morality , to erect a monument to his memory at Frankfort Ky. " Mrs, Edward Fennell comittee Mrs. C.C. Molehnd President and Mrs. William Cromwell Secretary. This item has been hand signed and is over 105 years old. William J. Goebel (January 4, 1856 � February 3, 1900) was a controversial American politician who served as Governor of Kentucky for a few days in 1900. Goebel was born in 1856 in Sullivan County, Pennsylvania, the son of German immigrants William and Augusta Goebel. He moved to Covington, Kentucky after his father returned from service in the Union Army during the American Civil War. After graduating from Cincinnati Law School in 1877, he partnered with former Governor John W. Stevenson and John Griffin Carlisle in law practice, specializing in corporate law and railroad law, typically in opposition to the acts of the railroads and large corporations. He made both a large fortune and many enemies in his legal practice. He was elected to the Kentucky General Assembly in 1886 as a member of the Kentucky Senate, where he served until 1900 when he was elected Governor (see below). He was President Pro Tempore of the Kentucky Senate from 1896 until 1900. During his time in the legislature, he was a strong advocate of increased civil rights, especially women's rights and rights for African Americans. He was also strongly in favor of stricter regulation of the railroads, limitations on toll roads, worker's rights, and breaking up the monopoly that existed on textbook sales in the state. As a delegate to the Kentucky Constitutional Convention in 1890-91, he tried to get these rights and reforms incorporated into the new Constitution, with little success. In 1895 he killed John Sanford in a duel resulting from a political dispute; Goebel was acquitted of criminal charges in the matter. Because of prohibitions against duelling in the Kentucky Constitution, the acquittal also meant that he was still eligible to hold public office. In 1898, he became the subject of much opposition in the politics of Kentucky after the passing of the so-called "Goebel Election Law", which reformed the electoral process in Kentucky and created a powerful three-member Board of Elections to oversee the process. In 1899 he won the nomination of the Democratic Party to the election for Governor. The convention that nominated him was so controversial that the party temporarily split over his nomination. The dissident faction of the Democrats ran former governor John Y. Brown as an alternate candidate. The Republican Party ran William Sylvester Taylor to oppose them both. In the closest gubernatorial election in Kentucky history, The Board of Elections certified, in a split 2-1 decision, election results which named Taylor as governor. The General Assembly, however, refused to accept these election results and called for a Committee of Inquiry into the election, which would name the winner of the election. On January 30, 1900, before the committee had formally published its findings, Goebel was shot by a sniper as he was walking up the steps of the State Capitol building. Incumbent Republican governor William S. Taylor declared a state emergency, called out the militia, and called the General Assembly into special session. In the immediate aftermath of the events, the legislature certified the election in Goebel's favor, although the Republicans in the General Assembly refused to accept the commission's finding. For about two days, it appeared that the Commonwealth of Kentucky was heading towards a civil war over the succession to the Governor's office. William Goebel was sworn into office on his deathbed on January 31, 1900. His only official act was to dissolve the calling-out of the militia that Governor Taylor had initiated after the shooting. Goebel died three days later and was succeeded by J. C. W. Beckham, his Lieutenant Governor. Goebel was buried in the Frankfort, Kentucky cemetery near the grave of Daniel Boone. With Goebel dead, the parties involved agreed to take the disputed election to the courts for adjudication. In May, 1900, the Democrats won and Goebel's (and through him Beckham's) election was upheld. Ex-governor Taylor fled to Indiana, while a lengthy series of trials began over the assassination of the Governor. Over the next few years, sixteen people were indicted in the assassination of Governor Goebel, including Governor Taylor. Three accepted immunity from prosecution in exchange for testimony, while only 5 eventually went to trial. Of the five, two (Garrett Ripley and Berry Howard) were acquitted. Three people were convicted: Caleb Powers (the Secretary of State under Governor Taylor), Henry Youtsey (a stenographer), and Jim Howard (a veteran of the Hatfield-McCoy feud several years earlier). The official findings and prosecution's case was that Powers was the mastermind, having a political opponent killed so that his boss, Governor Taylor, could stay in office. Youtsey was an intermediary, while Howard was the actual assassin. The fatal shot had been fired from the window of the Secretary of State Power's office across the street. However, these official findings were strongly disputed by many. Testimony at the trial was contradictory, and several witnesses were later found to have committed perjury. The jury pool was also heavily stacked with Democrats, making up 360 of the 368 eligible jurors. The appellate court, under a Republican judge, overturned the convictions and ordered new trials. The retrial of Secretary Powers ended in a hung jury, Howard was found guilty and sentenced to life imprisonment, and Youtsey turned state's evidence against Powers and Howard. In 1908, Governor Augustus E. Willson pardoned Howard and Powers, as well as Governor Taylor and several other persons still under indictment. Youtsey, however, was not pardoned until 1919. All parties proclaimed their innocence until their deaths.